Desert Island Singles: “Constant Craving” by k.d. lang (1992) | Name-Brand Ketchup. I have always dug k.d. lang. Her first indie release in 1984, “A Truly Western Experience,” completely knocked me out on the first listen. Her major-label debut “Angel With A Lariat” followed in 1987, and within the next two years “Shadowland” and “Absolute Torch And Twang” put her on the map. So k.d. was ready to spread her wings and fly beyond the confines of country. Her voice is so versatile that it welcomes blues, torch songs, ballads, and flat-out rock among other styles. “Ingenue” was her 1992 album, her biggest seller, and contained her best-known song, “Constant Craving.” It’s got almost a power-pop thing going with the jangling guitar break, a little bit of Latino influence with the conga drums, and the background vocals put me in mind of Motown and Phil Spector. The Rolling Stones’ 1997 song “Anybody Seen My Baby?” bears a resemblance to this song. Wikipedia reports that Mick and Keef shared writing credits with lang and co-writer Ben Mink to avoid lawsuits. The chorus of the Stones song sounds strikingly similar to this one. The “Glimmer Twins” claimed to have never heard the song before. Keef writes in his autobiography: “My daughter Angela and her friend were at Redlands and I was playing the record and they start singing this totally different song over it. They were hearing k.d. 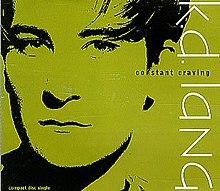 lang’s ‘Constant Craving.’ It was Angela and her friend that copped it.” Afterwards, lang said she was “completely honored and flattered” by the songwriting credit. This is not a Desert Island Single due to being her only good song. Far from it. k.d. has a full catalog of amazing music. Particular favorites are her duet with Roy Orbison on “Crying,” and her duets with Tony Bennett. “Constant Craving,” though, is my favorite song of hers.